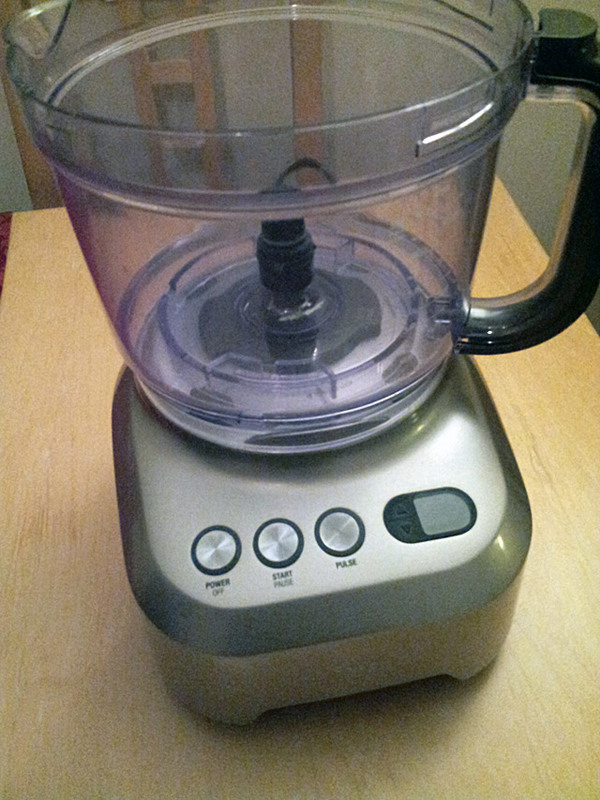 This is an update from my original Sage by Heston Blumenthal Kitchen Wizz Pro food processor review. To see the original click here. When you first get a new toy, you can get quite giddy about it. You’ll use every feature, you’ll tell all your friends about it, you’ll use it non-stop for two weeks. But do you keep using it? That’s the trick, isn’t it. Kitchen gadgets are notorious for gathering dust after the initial excited flurry, leading to an elephant’s graveyard pockmarked with bread makers, ice cream machines and electric spaghetti forks. Food mixers can be really bad for it. Will this suffer the same fate? One year on, does it still get used? Or is it resigned to a dingy corner of my loft? So what are it’s strengths? Wide range of blades. There’s a tool here for every job. The variable slicer blade is my favourite: most processors give you two blades of different thicknesses but this one has a genius disc with a variable dial on so you can get your ingredients sliced to the millimetre from 0.5mm to 8mm (very Heston). And your regular food processor blade has 4 blades on it, rather than the usual two. And yes, I’ve sliced my finger open on it, so I testify that it was sharp. Mrs. Spud swears by the dough blade for making cake mixtures. Very stable. It’s weight ensures it won’t go walking off the countertop. Tremendously powerful. Previous mixers and processors I’ve had can get jammed on a swede. 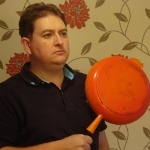 The Kitchen Wizz pro has a little chuckle as it blitzes it. FYI the motor is 2000 watt with a 25 (!) year guarantee. Very fast. Cuts down many chopping / grating / blending kitchen jobs to almost nothing. Large hopper. This is one of those things you don’t realise you need until you use it, then all food processors seem inadequate in comparison. Save time slicing veg into pieces before you process – because at 14cm wide it allows you to chuck in say, 4 or 5 carrots side by side. Or 2 potatoes. Genius. Smaller mixing bowl accessory. Smaller items, say making a garlic and ginger paste, can rattle around a large bowl and not get mixed efficiently. Having a smaller inset bowl option gets this job done. Smart appearance. As I commented last year the brushed chrome and greys are quite masculine, but you can’t deny it’s a classy look. 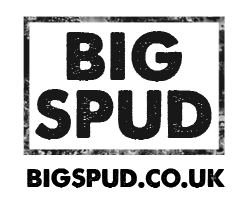 Cleanup. Nearly all of it can go in the dishwasher, so fire and forget. Quiet. Given the power, it’s surprisingly quiet. Lack of variable speed. You get cyclone or stop. There’s your two speeds. You can pulse but it’s not the same as building up to F-5 speeds. 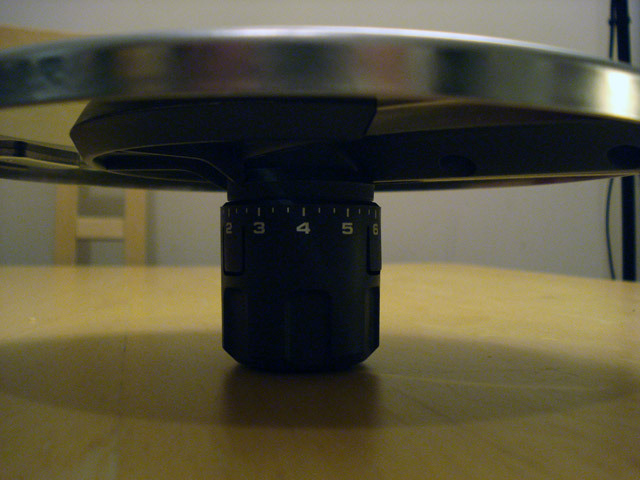 There are occasions when you want to ratchet down to a lower speed to add more items. Eats cupboard space. This is true of all appliances of this type, but this one has your base unit, your 2.5L mixing bowl and your box of blades. In my kitchen they are spread over three cupboards to fit them all in. Not all blades work that well. The plastic blades let the side down. This ’emulsifying’ disc – a piece of corrugated plastic – seems to do nothing. I’ve tried it whisking egg whites and the disc just spins through them merrily doing nothing (and yes, I made sure the bowl was spotlessly clean). Same with whipping cream, it just kinda pushes it around without thickening. And the dough blade is alright (see note above) but for bread not a patch on a proper dough hook from an overhead mixer. Because the plastic blade sits at the bottom it shoves at the dough sitting at the base of the bowl. It’s heavy. It needs to be, to stop it hurling itself out of the window when you switch it on. But this could be limiting for some people as the thing does weigh a ton. The price. It’s £399 (RRP) and I can’t ignore that. It’s not at the cheap end of the spectrum – but none of the Sage by Heston range are. Kitchen Wizz Pro Food Processor: is it worth it? See that last point in the negatives? Go back and read it. Yeah, so the RRP is £399. It’s a lot of dosh. But when it comes to a gadget like this, I don’t see the point in buying the Tesco Value food processor. It’s got to work hard, and replace a whole bunch of tools in your kitchen, and save you time to earn it’s keep. And if you’ve decided to get yourself a food processor, you’ll be looking at the alternatives and some will be similar in price, and some much cheaper. But the sheer power of this model, along with it’s wide range of tools (even if not all of them are perfect), plus the other features make it the perfect kitchen accessory. It is absolutely worth it. I bust mine out at least once a week, sometimes more often, whenever I have a bunch of chopping to do on a weeknight for a casserole, pie or stir fry. Or to pull together pastry. Or to grate stuff for coleslaw. Or blitz onion, garlic and ginger for a puree. If you are after a proper kitchen food processor, that can take on a load of dull jobs, this is a very serious contender. My advice is as before: ask for vouchers for birthdays, Christmas, whatever and put it towards this bad boy. 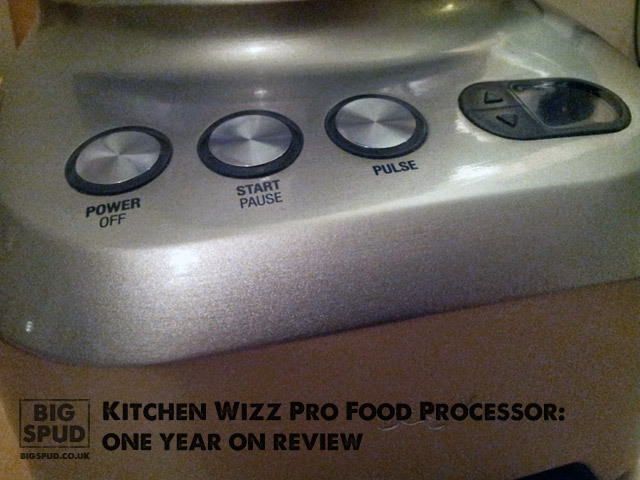 For another view of the Kitchen Wizz Pro food processor, check out Ren’s review. Very interesting. Jo’s Kitchen recently road-tested the Magimix CS 4200 XL. See what she thought. Helen’s story with Magimix is an encounter with poor customer service. Checking out the Russell Hobbs Illumina range? Camilla’s chilled picante soup has the low down. The Kitchen Wizz Pro is available from Amazon. Enjoy that review? Never miss a post from Big Spud by subscribing to my emails. It only takes 10 seconds and you’ll get new recipes and food stuff every time they’re posted. Erm £399 – it looks like it does the job, but I don’t think I would love it enough to justify that! Sage often run mobile demo sessions Stuart – try it out if you get a chance. Then see what you think! Yeah it’s a well-used toy in my kitchen. It does come highly recommended. Brilliant idea to go back after a year and see whether you are still in love with your new shiny toy. I think it’s useful to get past the honeymoon period. I like all the different attachments it has with it. Sure is a tool for every occasion. Bench space is an issue in our kitchen so whilst I would love the variety of blades this and other processors offer, I tend to rely more on a good knife and a mandolin – perhaps one day when I have a larger kitchen I will think again as the time factor is a particular benefit! Size is definitely an issue here. I’d be interested to try one of these to see how it lines up against my 10 year old Magimix which is similar price bracket. The hopper on the Magimix is quite narrow and I find the chip blade is a bit rubbish. 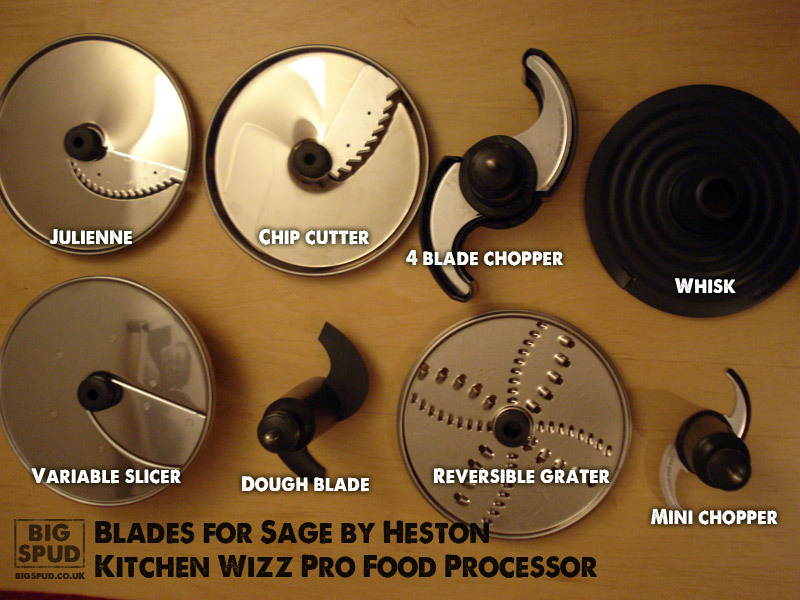 Having looked at these Heston Sage gadgets in Lakeland, they do look and feel very good quality compared to cheaper equivalents. I recently tried the Russell Hobbs processor and it feels very cheap and flimsy at £80 but seems to do the job. I bet it wouldn’t last 10 years though! Thank you for the review! It looks pretty amazing indeed! Sure is. Happy to answer any questions you have on it Helene. I’m so close to getting one but … Have you made protein balls, nut butters & green smoothies in it? If yes, how did it go? Thanks for the very useful review. I have found that when using the small bowl for liquids or dry ingredients there is a spill over into the large bowl which is annoying. This is even with small quantities, e.g. chopping 100g of chocolate. Have you experienced this or could there be a fault with my machine? Hi Karen. That’s interesting to hear. That small bowl is probably the accessory I’ve used least with the gadget but I see how that could happen. 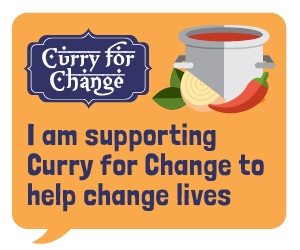 It’s well worth contacting support, they were super friendly to me when I talked to them about an issue I had. Karen – I’ve found that too. I make cashew nut butter the other day and ended up with bits in the main bowl. I don’t think it’s a fault on your machine. I’m with you on the dough blade. Tried it a could of time to make pastry but ended up going back to the metal blade. I had more success with the disc for whipping. Perhaps you have a faulty one? Bit of a gimmick. I have their stand mixer and that’s my go to for whisking and bread making. You could be right on the whipping disc. But as you say I have other tools for doing that job so I’m not that fussed. Thanks for the comment David! I got one of these (second hand), partly because of this review and I have to say, I’m super impressed with it’s power. I tried making peanut butter in my little old mini food processor and it was a long, drawn out process and I had to keep pausing to allow the motor to cool down! The Sage Kitchen Wizz ploughed through the peanuts and gave me ultra smooth peanut butter in a few minutes. Also impressed with the build quality, a very solid piece of kit. Glad you have a similar experience to mine. Still well used in my kitchen, doing a job lot of grating tonight coincidentally! Nice review. Do you know if it can make nut butters? Not just nut-crumble but nice and creamy nut butter? Thanks for the thorough review as I was in 2 minds whether to choose the magimix or the sage FP. Your review has made up my mind. Was just wondering .. Why does it not have a spiralizer attachment? Hi Jan. I hope you like it! I imagine it doesn’t have a spiralizer attachment as it was released a bit before the spiralizing ‘craze’. It does have a ‘chipper’ disc which will produce chunky shapes that might be a good substitute.